Amy's grandmother, Lady Mairead, insists that Amy must read while she resides at Lennox House—but not in the usual way. Amy learns that she is a book jumper, able to leap into a story and interact with the world inside. As thrilling as Amy's new power is, it also brings danger: someone is stealing from the books she visits, and that person may be after her life. Teaming up with fellow book jumper Will, Amy vows to get to the bottom of the thefts—at whatever the cost. 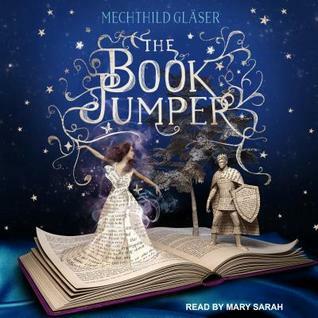 About the Author: Mechthild Gläser was born in the summer of 1986 in Essen. Even today she lives and works in the Ruhr area, where she devotes herself to her studies and dances ballet incredibly poorly from time to time - but only when nobody is looking. She started writing early and her laptop is still on the pink desk pad on which her first stories were written. She finds inspiration everywhere, but best with a cup of peppermint tea. Noteworthy experiences while reading this book: I love the use of literary references in this book! Check out author's other books or related books? I have yet to look into Gläser's other work, mostly because a lot of it is in German and I do not understand German. Recommend this book? Yes and no, I enjoyed reading this book, however, the ending was lacking. It left me wanting more which is great in a series book, however, this is a one type book. As I said, I did not like the ending and I wonder if something was lost in translation because I felt it ended with a question. I did love the journey and the world that was created. I loved reading this book more than I have enjoyed reading other books. The idea of jumping into the book world is what all us readers wish we could do. Experiencing the characters and talking to them is my dream! It was a cute read with a fun young love story. Let us hope she decides to make it a series. Go Into This One Knowing: The ending is annoyingly vague.